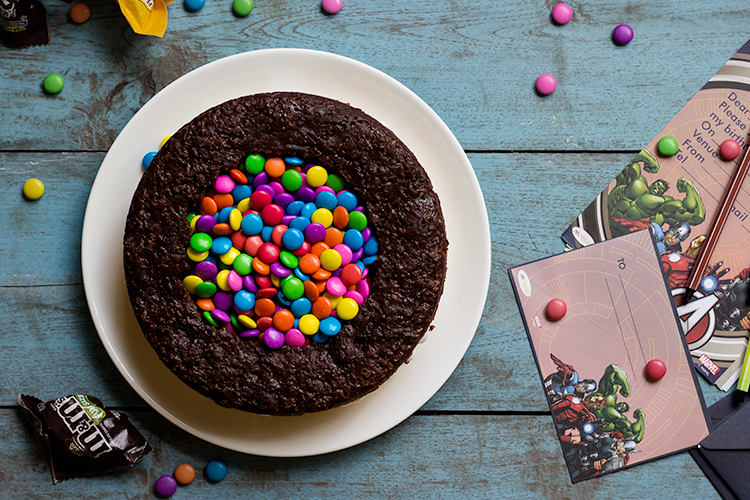 It was Vedanta’s 8th birthday last week and he like a good boy of a supermom, asked for a M&M Piñata cake. When he asks, I give. No questions asked. I used my chocolate and vanilla recipes to create this cake. It is a very simple cake to assemble. The only trick is to cut rings from layers and fill the subsequent well made with M&Ms. I alternated between chocolate and vanilla as my son gave specific layer requirements. But you can make any flavour you like. You can frost in any way, using ganache, glaze or whipped cream. 1. Bake one chocolate cake as per instructions given in the recipe. Bake two layers of vanilla cake. 3. Using a cookie cutter or a lid of a container, scoop out the center of one vanilla and chocolate layer, leaving a ring in the center. 4. Place the ring vanilla layer on a platter or cake stand. Make some holes into the bottom layer using a fork. Soak the bottom layer in sugar syrup. Then lightly spread whipped cream. Place the ring chocolate layer on top of the vanilla layer & repeat the process of soaking & spreading filling. Fill the well made in the center with M&Ms or gems or candies of your choice. Now place the second vanilla layer (which is whole and not cut out) & again soak it. Lightly spread whipped cream on top & sides of the cake making a crumb coat. Refrigerate the cake for 1 hour. 5. Remove from refrigerator and frost as per your preference. Chill and serve. And enjoy the accolades. I was less generous with soaking in this cake as I felt that syrup might lead the M&Ms to bleed.